***I received a Dallas Cowboys Bacon Lovers Gift Pack from Petit Jean Meats for the purpose of this post. No further compensation was provided. All photos are copyright Momma Told Me 2013. Most little girls dream of growing up and marrying a prince; the lucky little girls dream of growing up and finding a man as wonderful as their father. I was fortunate enough to have had, and still have, a great relationship with both of my parents. However, while Momma spend the majority of her time raising me, Pop was the one who brought home the bacon in our household. He worked 9-5 (and then some) every Monday through Friday as far back as I can remember. He didn't have the pleasure of building forts with me during the summer, or watching my learn how to swim at the local community pool. He wasn't there when I lost my first tooth, or when I broke my arm rollerskating; but I knew he loved me just the same. You see, while Momma had to make tough on the call discipline decisions, and enforce nap and bedtimes, Pop was the knight in shining armor that came home just a little late from work and convinced her to give me a pass so we could play one more game of chocolate checkers. In my child's mind, Daddy was my hero, and I treasured ever moment I got. Today, as a grown woman, my relationship with my father has changed considerably from kissing boo boos and checking homework. While Momma and I will be 'girlfriends' the rest of our lives, my relationship with my father has matured into one of respect. He is the rock I can go to when times get shaky, my Endless Shrimp at Red Lobster partner in crime, and the man I judge all other men in my life by. Again, I know not everyone is as fortunate as me, and that makes our relationship all the more special; but what I value most is the manner in which he morphs from trusted advisory to foodie accomplice. It's safe to say I've gained both my love for food, and passion for bacon, from my father. He is a man's man who loves fast cars, roots for his home team, and has legends of his love for food spread across this land. (I kid you not, my great Aunt still tells food of how he would always request a second Hoagie (sandwich) for dessert when the family would go out for dessert.) The list of food my father loves is vast and long, but at the top Bacon holds the title. Not to long ago, while amidst a flurry of dates, my father remarked how he had bought countless arrangements of flowers for women throughout his life (he's a real catch, ladies), but couldn't recall a time when he'd been given them. So, it was only natural, when a Dallas Cowboys "Bacon Lovers" Gift Pack landed on my doorstep last week, a decided I had the perfect remedy to fix that. 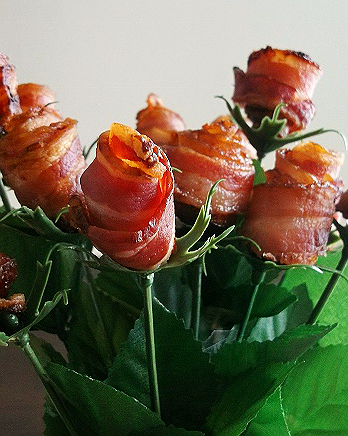 I would make my father bacon flowers for Father's Day- and not any old flowers, but bacon roses! By now there should be no doubt in my readers minds, I am a bacon addict, myself, and Petit Jean's premium cut bacon is my preferred brand. Not only do their feature their famous Peppered Bacon in this gift pack, but their Hickory Smoked bacon as well. While the Hickory Smoked comes in a special Thick Cut variety, as you can see, the standard Hickory Smoked is fairly thick on it's own and features beautiful marbling. Attempting this project with bacon of a lesser quality would prove much more challenging and less impressive in result. You might have seen a photo of Bacon Roses floating around the internet, on one social media site or another, and wondered if it was real. I can't speak to those images, but I assure you Bacon Roses are not the unicorn of the foodie world; they are very real. Even better, require materials are minimal, and cost is quite reasonable (so don't skimp on the bacon quality, and choose Petit Jean Meats!) First you must acquire some fabric flowers from your local dollar store. You can purchase more expensive silk flowers at your local craft shop, but I find no need for that, since you will be taking them apart, and using only the stems. Prepare your face flowers by firmly grasping the flower, at the plastic 'leaf' base, and pulling up and away from the stem. Using 'bunches' of flowers that meet at one shared 'stem' at the bottom will prove easier to arrange and handle than individual flowers, as they offer more support for the weight of the bacon. 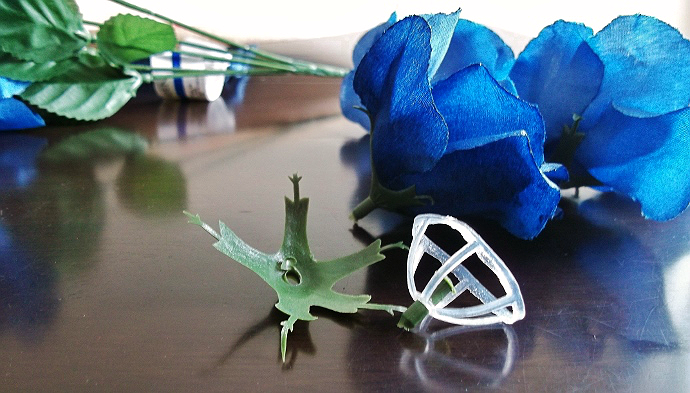 Once you have separated the flower begin, carefully pulling apart the layers. You should end up with 3 components, the plastic 'leafy' base, a small plastic netting, the fabric 'petals' and a little stem nub that pins them all together. Throw the fabric petals away, as well as the netting. Note the round netting (clear in the image above) might be black or dark green, depending on where you buy your fake flowers. 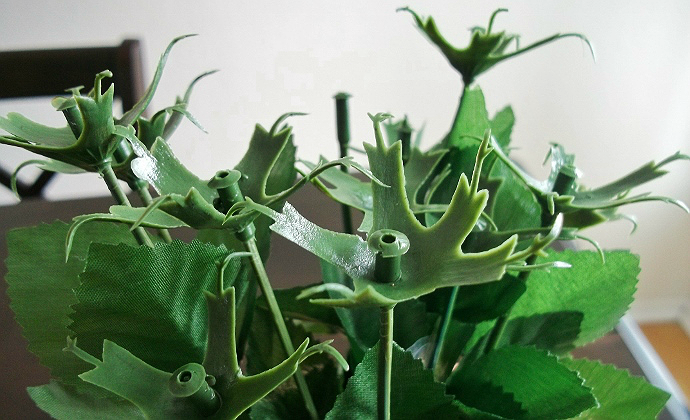 Reassemble the stems by pushing the plastic leaf base (as shown above) back into the connecting nub, and snapping the nub back onto the stem. Make sure your 'base' is at the bottom of the nub, as to offer sufficient room for the nub to slide into the center of your bacon roses (as shown below). 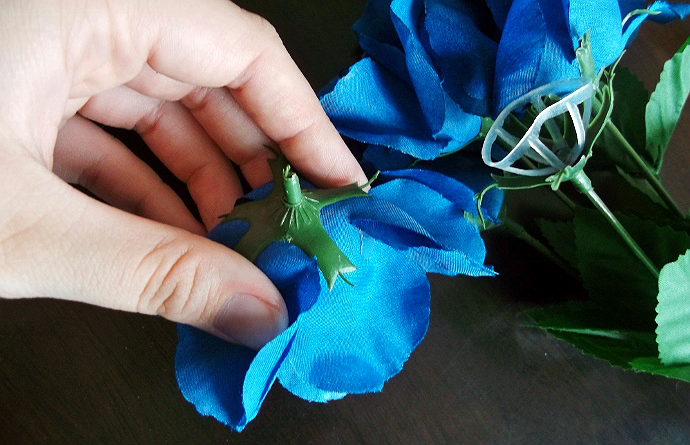 Making the actual roses couldn't be easier. While you are at the dollar store buying your fake flowers stop by the kitchen utensils aisle and pick up a cheap muffin pan. When you get home take a nail and a hammer and tap a uniform hole into the bottom of each muffin cavity, or use a drill to accomplish the same. These holes are key to draining excess grease in cooking; simply place your muffin pan on the broiler or oven rack, with a shallow baking sheet/pan beneath to catch the drippings. This will prevent uneven cooking or burning at the base of your roses. 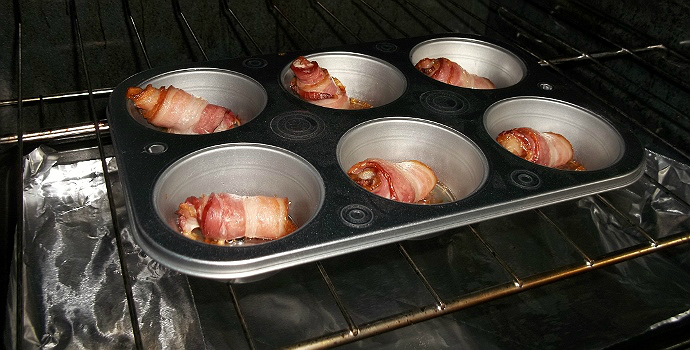 Next, preheat your oven to 375F and prepare to begin crafting bacon rosebuds. 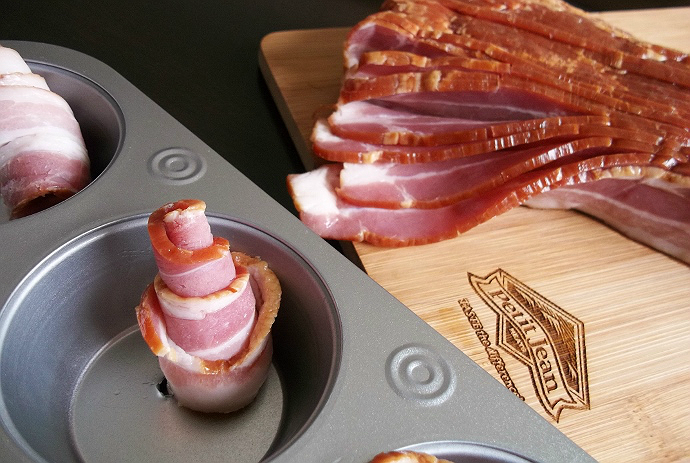 It's as simple as rolling the strips of Hickory Smoked Bacon, then setting them semi-upright in the muffin tin. (I was able to fit two roses per muffin slot.) Be sure to make more roses than you have stems; some may fall off and roll onto the floor when arranging, some may turn out looking prettier than others, and the rest will taste delicious when eaten. For my project I prepared an entire package of Petit Jean Hickory Smoked Bacon and placed the spare buds in a Ziploc with a paper towel (to absorb grease), and presented it with the arrangement to my father. Experiment making the bacon roses skinny and narrow,like a bud, and fat and round like a blooming rose. Just ensure you have a tight center at the base of your rose to slide the little stem nub into when building your roses. If you need to trim some excess bacon off the bottom of the rose to fit the rose on the nub and base, this is fine. I found you can actually get quite creative and even fold the outer end of the bacon strip down, like a curling petal, prior to baking. Cooke bacon roses in the oven (at 375F) for 30-40 minutes, until done. Arrange your bacon roses in a vase (we found a slender stem vase worked best to support the weight of the roses, and keep the arrangement steady), which you can also buy at your local dollar store. Fill the bottom of the vase with the recipients favorite candy, or glass marbles/beads to add extra stability to your recipient. Store your arrangement and extra roses in the fridge until ready to gift. I gifted my Bacon Roses to my father yesterday (his birthday also happens to be on Tuesday), and his social media page quickly blew up with comments and likes. Not only that, but my father proceeded to snap about 50 photos of his bacon arrangement throughout his house to capture the best 'lighting'- I think it's safe to say he was thoroughly tickled. Don't gift this arrangement to any man without backup bacon, though, or it won't last the day! I was tickled to see my father so excited, finally having received his 'flowers', and was happy to hear him remark "These smell better than any other roses I've ever known!" 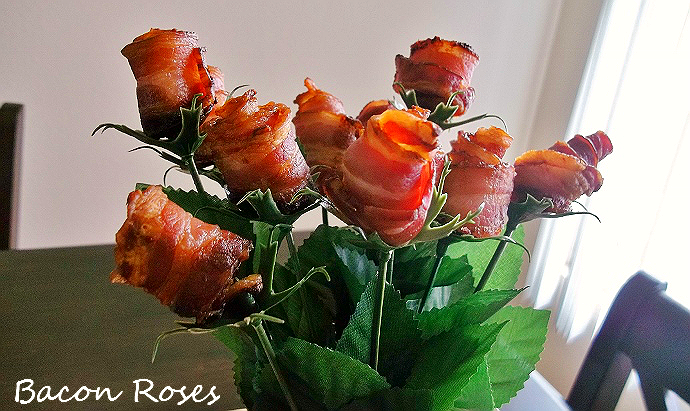 If you're looking for a unique gift for the man in your life order a Bacon Lovers Gift Pack from Petit Jean Meats (after all, it's the official bacon of the Dallas Cowboys), and present it with a dozen Bacon Roses- it's sure to be a hit! For more tempting bacon crafting ideas and recipes, sign up for the Petit Jean Meats newsletter. 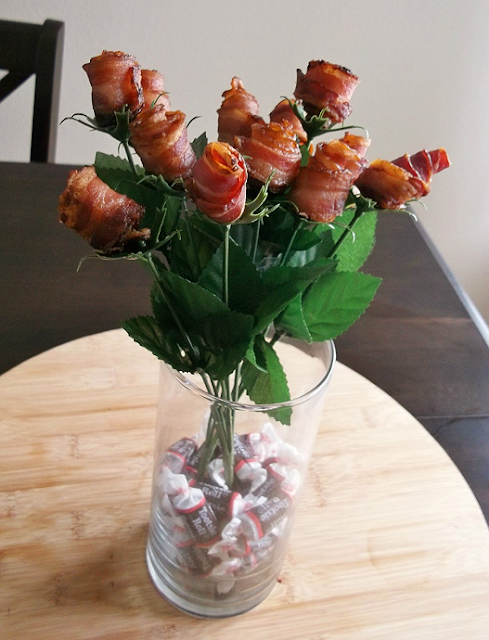 What Daughter Says: For a truly unique gift your bacon loving man is sure to love, try a simple, and affordable, Bacon Rose Bouquet. 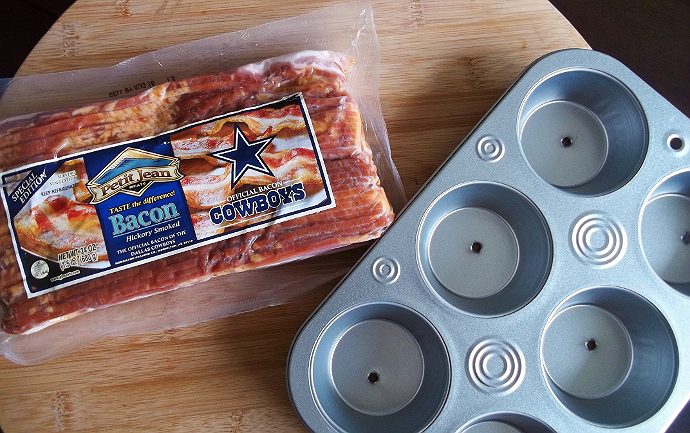 One Momma Told Me reader will win a Petit Jean Meats Dallas Cowboys Bacon Lovers Gift Pack! Wow! Bacon roses. You weren't kidding. And they actually look REALLY cool!! You have the best posts. As for something to try from Petit Jean meats....I think the spiral sliced ham would be great for a Father's Day dinner. Well that's neat. I have never heard of that before. 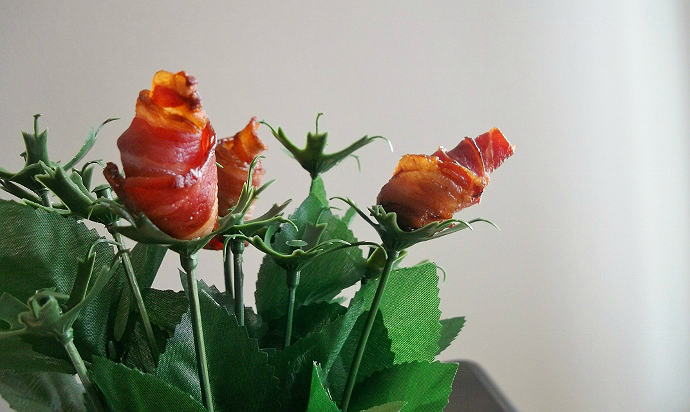 bacon roses?!?! ahhahaha hilarious! i should get one for my man, lol!! i want to try that hickory smoked bacon!! I saw a friend of mine making these for her kids for Valentine's day this year and I thought, "hey I should do that!" and guess what? I forgot all about it until today! I love your pictures. I love this idea! I NEED to make this for the hubby on Father's Day! That is seriously the most creative use of bacon I have ever seen. Once again my mouth is watering. Great job! Would love the complete Turkey dinner right NOW! Bacon roses are really a unique appropriate gift for a guy - all the ones in my life love bacon. I would like to try the Deluxe gift box with the bacon, ham and smoked sausage. Thanks. I want their Breakfast Gift Box! Everything good and yummy in that one sweet box. Those roses are awesome!My guy is a bacon FANATIC..that would be a great gift for him.The Breakfast Box looks really yummy too! The smoked Turkey breast would be wonderful!!! Of course, I think the man here would prefer the bacon. My husband would want the Deer Summer Sausage. The Christmas Sausage looks great! The Christmas Sausage looks great!! I would like to try the Deer Summer Sausage. I'd like to try the smoked turkey breast! My hubby would love the Peppered Spiral Ham. Bacon roses! Awesomness! I'd,love the BNLS DELI HAM FULLY COOKED. I have a slicer and would shave it thin for sandwiches. I like the breakfast gift box. Looks good. Id like to get the spiral smoked ham or the ham/bacon gift box. A complete turkey dinner would be great. No kitchen mess to clean up! I'd love to try the sweet potato casserole! He'd like the Ark Style Smoked Sausage Links. I'd love the breakfast box...for myself. I love bacon! I would love to try the summer sausage ! I'd love Ozark Hickory Smoked Spiral-Sliced Ham for a special occassion! My dad would love the spiral ham. I like the gift boxes- great for the hard to buy men in my family! I'd love to try the Bologna. I love bacon, but the Pecan Cobbler sounds good too! I'd like to try the BNLS DELI HAM FULLY COOKED. Thanks. I like their deluxe gift basket and also their samplers . You did a great job on the bacon roses!! My family orders their hams every year for Christmas! But I'd love to try the smoked turkey! I'd like to try the Arkansas Style Smoked Sausage!